I am not really a “dog-person”. Don’t get me wrong, I like dogs, I just never owned one myself. As a child we had a dog in the house, but he belonged to my brother and I never really bonded to him (the dog that is, my brother was cool). But, if I could have a dog, if I lived somewhere that had a large yard, or place for a dog to play and generally live a happy life, then I would choose a Bull Terrier. Yes, that would be the one I would get, because to me they are the most wonderful dogs on the planet. I think my yearning for a Bull Terrier is due to a couple of factors: 1. when I was about 4 or 5 years old I spent the day with a Brooklyn family that had a large white Bull Terrier. She was a very loving dog who seemed to radiate an aura of protectiveness over all the children. I remember falling off a top bunk bed I was playing on, and the dog was immediately there, perhaps checking to see how I was doing, she seemed concerned. I don’t think any of the adults in the house even knew I had injured myself. And, 2. I was thrilled to see that this was the breed of dog Bill Sykes had in the movie version of “Oliver!” I loved that movie, and every time I watched it, I was reminded of how much I wanted that dog, and how loyal they are, in addition to being so cute. 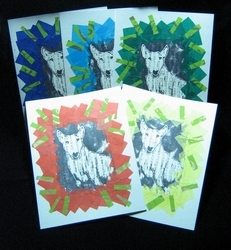 Some years ago I designed and hand-carved a soft-block Bull Terrier “stamp” and I used it to make prints and a few personal greeting cards. I think I wrote: “Have a dog-gone great birthday!“ something like that, as the inscription. The next time I used the stamp I wanted a little variety so I created some sets of blank greeting cards where I added a little collage border over the jagged edges of the image. I printed the Terrier with black ink onto different papers–my favorite turned out to be some Japanese novel pages I had pulled from old books I had bought from the NY Public Library–I think that text in the background adds some character to each face; (my husband said it looked like “The Matrix”). Then I surrounded each print with layers of small pieces of tissue paper. 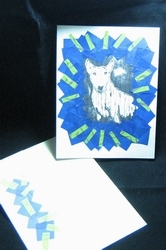 To make the sets, I added a little of the tissue design to each envelope flap to coordinate with the card colors. They turned out so festive and I haven’t decided which one I will frame and display. The other cool thing about these collage prints, besides their versatility as wall decor or cards, is that they are not “frilly” and they seem to radiate an energy because of the tissue placement and colors. I had a lot of fun making these pieces and I think I will use this tissue border style to make some other similar items with different images in the center.